Type 2 diabetes mellitus is recognized as a significant risk factor for fragility of bone. Among the newer anti-diabetic agents, dipeptidyl peptidase-4 inhibitors (DPP4i) have been reported to decrease the occurrence of bone fractures although the reason is unclear. 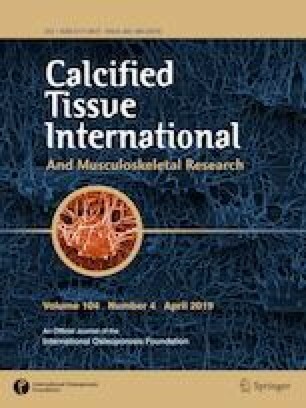 The main aim of this study was to evaluate the impact of sitagliptin treatment on tissue bone strength and compositional parameters in the high-fat-fed mouse model. Male NIH swiss mice were allowed free access to high-fat diet for 150 days to induce chronic hyperglycemia and insulin resistance. Sitagliptin was administered once daily for 3 weeks. High-fat-fed mice administered with saline were used as controls. Bone strength was assessed at the organ and tissue level by three-point bending and nanoindentation, respectively. Bone microarchitecture was investigated by microcomputed tomography and bone composition was evaluated by Fourier transform infrared imaging and quantitative backscattered electron imaging. Administration of sitagliptin increased non-fasting insulin, improved glucose tolerance and increased insulin sensitivity. This was associated with clear ameliorations in bone strength at the organ and tissue level. No changes in trabecular or cortical microarchitectures were observed. On the other hand, higher values of Camean, Caturn, collagen maturity, mineral/matrix ratio, mineral maturity and crystal size index were evidenced after sitagliptin treatment. Correlation analysis significantly linked the modifications of bone strength to changes in bone compositional parameters. These results bring new light on the mode of action of sitagliptin on bone physiology and demonstrate a benefit of DPP4i. The authors are grateful to Nadine Gaborit and Stéphanie Lemière (University of Angers, GEROM-LHEA, Institut de Biologie en Santé, Angers, France) for their help with microCT. This work was supported by Grants from the Irish Endocrine Society as well as University of Ulster Research Challenge Fund and Proof of Principle Funding Programs. Sity Aishah Mansur, Aleksandra Mieczkowska, Peter R Flatt, Daniel Chappard, Nigel Irwin and Guillaume Mabilleau, declare that they have no conflict of interest. All procedures were conducted according to UK Home Office Regulations (UK Animals Scientific Procedures Act 1986) and approved by Institutional Animal Care and Use Committee of University of Ulster. Animal study is reported in compliance with the ARRIVE guidelines.